I’ll begin by reading my own boots. Right boot: I’m right handed so that’s my dominant side and conscious mind. Left boot: My left side is my weaker side and subconscious mind. Field boots: That means I’m a lower level dressage rider because dress boots are required at the upper levels. Dirt: I took these photos right after a lesson and I didn’t want to remove any…evidence. Yeah, that’s right. Evidence. Wrinkles: I have short calves. (Hey, it’s the whole package here. I’m short. To be specific 5′ 1.5″. Notice the half inch?) These are off the shelf boots and to be honest I either need custom made or another brand. There are more wrinkles on the left boot. Perhaps that calf is shorter (God forbid!) then the right? Remember our bodies are not identical side-to-side. Inside leg: I’m using my inside leg as indicated by the pink circles. That’s good! With my inside leg I can communicate more subtly with my horse. I’m also providing a corridor between my legs for the horse to travel through. Hopefully, I’m not clinging. 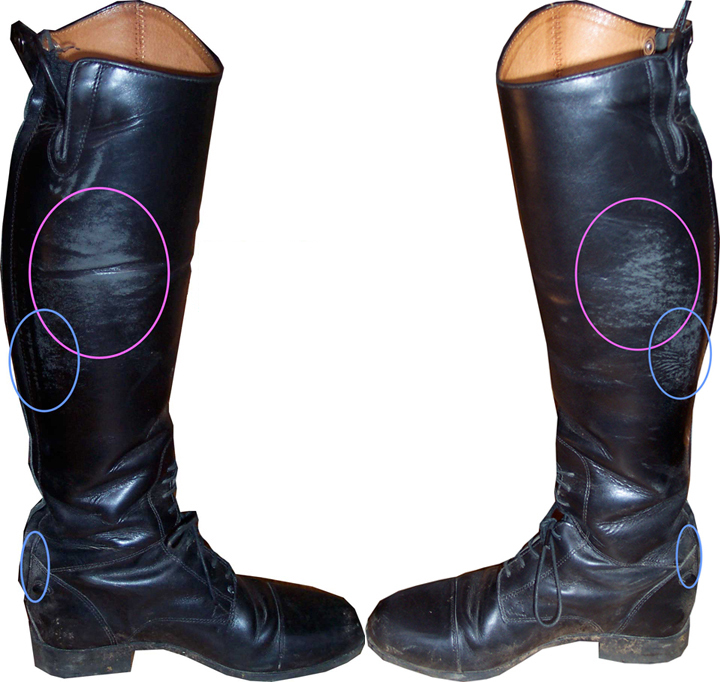 Back of the leg: There are two blue circles on each boot indicating that I’m still using the back of my leg. Not so good. Sigh. When I use the back of my leg I’m opening the door. Of course, the horse is going to step right through and out. Wouldn’t you? View from the back: The view from the back confirms that I’m using my inside leg. It becomes more obvious on the left boot that I rely on the back of my leg more. A bad habit from my H/J days that I’ve been trying to break. Subconscious mind: Maybe a little unsure of myself or the horse. The rubs are stronger on the left leg and a bit higher up. I may go fetal more frequently with that leg (think canter!). Conscious mind: Feeling confident for the most part. Notice that the rub marks are lighter and lower on my right leg. Feel free to add your observations. Better yet, post photos of your own riding boots and readings. I enjoyed this…my favorite boots are ten years old and you can read the progression on the calf of how turned out my feet and legs were back then through the more current wear that approaches a hopefully more “correct’ leg placement now…. Would love to…but the boots are in Florida and I’m on Long Island snowed in! But when I get there, that would be great! I have a new camera to play with…..Don’t you love reading boots….it’s like reverse tea leaves…. We got hit with at least a foot in the Boston area. Just let me know when you have a chance to take photos. I’ve always heard about our boots telling us about our riding but I can’t find anything on the internet! Unbelievable! I can find anything! Hi Horseypants! Would you like to send in a photo? I’d be happy to “read” your boots. Monetize? Hmmm, I like money. I heard that dress boots are really stiff so I’ll stick with field boots for now. Just be warned! Field boots and peacock stirrups do not play nice. My loops have gotten snagged a few times and I almost got hung up. At the moment I’m in winter riding boots. I enjoyed this! I just started a blog and it’s a little intimidating but I looked through yours for some inspirtation! Thanks for the hel[p and when I get back I’ll post on your blog a reading of my boots. I have a few pairs so we’ll see if they show consistent results!!! I’m almost afraid to look! Hi Tango! Don’t be intimidated. I started this blog, then dropped it for a number of months and picked it up again. I did it for myself, to vent about my riding lessons. (OK and to laugh about my blonde moments.) There really aren’t many people writing from the lesson student’s point of view. Feel free to write about your readings on your blog and I’ll link to it if you let me know. Did you read up on blogging or are you just very creative? I am going to keep pushing along and hope to learn something on the way- as a trainer that finds adult amateurs complicated (I enjoy them but my teenagers sure are easy!!!) i will continue to read your blog in an effort to better understand the psyche!! thanks again! No, I didn’t read up on blogging. I don’t even remember really reading a blog before I started mine. I stumbled across them here and there during searches though. You find me creative? Thank you. I have a BFA in Graphic Design and I’m an avid reader. In school I was told that I could write…I guess it just all comes together here. I’m not trying to teach anyone through my blog because I don’t feel that I know enough. Although an instructor asked my if I’d teach (shrug) so maybe I do. I’m just sharing glimpses (not blow by blow steps) of my lessons, etc. Maybe you should write from a trainer’s perspective about different students. Compare the differences of the teens to the adults. What in your opinion is a perfect student? Share a triumph, the agony & defeat. I’m not a newbie rider either. I started riding 8 years ago but I’m…enthusiastic. My private email is listed in an earlier reply if you’d care to discuss things offline. Good luck and I’ll check in with you soon! I’ll be the first one to admit that I over think it. I agree with long term commitment but I don’t think we all fall in that category. As an adult rider you could be a very successful exec. but a dead beginner on a horse. How long does it take to be proficient? to show, etc. It can be frustrating to realize that it could be months or even (gasp!) years. Unrealistic expectations from the rider and sometimes the instructor. Then there’s a realistic fear of falling. We don’t bounce like kids and even worse we may have dependents that depend on our ability to earn money. I get tunnel vision and focus on the bad things, totally forgetting about the glimmers of good stuff. Mention it was a good lesson, or improvements were made in an area. Trust is huge! Trusting my instructor, myself, the horse. Mileage. We all need mileage. Personally, I have good balance, I’m in decent shape, good muscle memory as long as you tell me when it’s right. I was pretty much a dead beginner at age 45….one of my pet peeves with the pros is that they “forget” that an adult with 5 yrs. into riding is equally experienced as a junior rider of 5 yrs. ridng experience….which makes that adult a very young rider! Yet the kid will be pushed and praised and encouraged, while the adult is just someone who started late and not coached as effectively. I feel that the trainers automatically lower their expectations! I don’t know if this is conscious or unconscious on the part of trainers! But in my 12 years of ridng I’ve come up against it with every trainer I’ve ridden with. It’s the “oh you’re just an adult amateur rider” syndrome. It permeates our USDF and the USEF….where they sure love to hit the adult amateur base for financial aid and volunteers but give a heck a lot LESS back to us in the long run! I grant there are real differences between adults and kids…muscular flexibility, kids don’t have the fear of pain, injury and death that the adults have, those two come to mind…but I would maintain that adult starters have a real shot at success, maybe more than the kids in Dressage who may actually give up horses to go to school, for the boyfriend, for marriage and kids…we adults tend to stick it out a lot longer because we understand that time, commitment and a certain financial investment makes it happen for us. So we may not make the Olympics, but we certainly have the capacity to get to Grand Prix….Kid or adult, we all have to put in the work! And I believe we adult amateurs generally have it over the kids in that department! And Dressage Rider, I want you to go on and on…this is fascinating and I love talking through all this stuff! I may not arrive at any hard and fast conclusions but it sure helps with the learning process!!! Hi Anon, I agree with you that sometimes trainers have lower expectations of the late blooming adult rider. I think that’s when we need to have an open discussion with our trainer to discuss our goals or even say “push me”. I’m worse then “just an adult amateur”, I’m a lesson student without a horse. Gasp! You also bring up an excellent point regarding the USDF/USEF. We ARE their bread and butter. However, I’ve read that change is a foot and they are open to other ideas. Darned, if I can remember where I came across this info. I’ve also been a volunteer at shows and at least once I was offered waived entry fees…if only I had a horse. Sigh. Egads Tango! Don’t compare this to a bulletin board…blech! This is one of the first discussions, if you will, and I’m enjoying it. I’ve taken your comments to be genuine. A true request for knowledge. Please don’t tailor your comments and I’d love to know more from the trainers point of view. Hey Dressage rider! I have boot photos but am not sure how to get them to you…should I post them in my blog? struggle to keep proper leg position and stay balanced in the saddle. she sat me down and asked me ‘where do you see yourself in 5 years’. @ Barogue Lady, Isn’t it cool? That’s so wonderful that you’re doing so well in your lessons! Adult amateurs rock! BTW I didn’t clean my boots until after the photos as I was afraid of destroying evidence. @ Halfpass, You really had me going there. I wasn’t sure why the person would choose to be Anon. I owe you a reading so stay posted! Hey dressage rider….that anonymous post was me!!! I don’t know why it didn’t say halfpass…. Absolutely brilliant idea. I love it! Thanks Kim! BTW, I love your new site. I’m bummed out that I can’t keep track of you through my WordPress subscriptions though. I guess that means I need to get with technology and sign up for Google Reader or something…so many blogs to read, so little time. “Doing so well” in my lessons is not quite how I see it which is why I said I was ‘second level-ish’. My progress is so uneven. Some things I can do very well and there are some quite basic stuff I struggle with…like timing of half halts in the canter. I ride my teacher’s 4th level schoolmaster . She is great. If I let her, she will plop around nose stuck out and hocks trailing! But if I ask correctly she will give me a lovely collected trot. I am just starting to understand how to use my seat instead of my hands to accomplish proper transitions. I love your blog! Hi Baroque Lady, Thank you. You’re further along then I am. If I had to define where I am it would be First level-ish, I guess. I also have access to a 4th level schoolmaster and he can be totally on the forehand if my aids aren’t there. If I’m too there with the outside rein I get a beautiful passage. I’m trying harder and harder to use my seat aids over my hands. Hands! That’s a whole other post. I love your “bootistry” readings. I’m onboard. I’ll send you a photo as soon as I can get to it! Hm. My boots are newish. Not sure what they’d tell you. I have a pair with a broken zipper I can dig out maybe compare those? One “wear” pattern you’ll find on my boot is wear on the outside of the calf. One ! @#$%# horse I ride consistently looks for an opportunity to scrape my leg on the rail. Most of the time I stay conscious, but there’s that one moment when someone calls my name, or a turkey flys by, and scraaaaaaape. I swear he knows! Alright! I’d love to read your boots Jane. My boots are newish too. I bought them a year ago but by the time I broken them in, etc. I had only been wearing them a few months. We can try to compare too..see what your trying to hide with new boots LOL! I can relate to the wall scraping. Thunder tends to scrape me against it when we’re on the right lead. I haven’t coordinated my thoughts and aids enough to get him more balanced on the left side…but…my foot is parallel to his body and it’s only the stirrup iron scraping. I’ve got a boot marking I want to show you! It perplexed me for a long time but I figured it out! I’ll take photo tomorrow and post here! Looking forward to seeing the photo and what created the marking. I don’t think you can post the photo unless you send it in to me or post a link to it somewhere else. We’ll figure it out though. hOur company provides a wide variety of non prescription products. Look at our health site in case you want to feel better with a help health products. Our company offers herbal supplements. Take a look at our health contributing website in case you want to look better. Our company provides a wide variety of non prescription products. Look at our health website in case you want to strengthen your health with a help of general health products. Our company offers herbal healthcare products. Take a look at our health contributing portal in case you want to look better. Our company provides supreme quality healthcare products. Visit our health contributing portal in case you want to feel healthier. Our company offers a wide variety of non prescription products. Look at our health website in case you want to look better with a help of general health products. Our company offers a wide variety of healthcare products. Look at our health contributing portal in case you want to feel healthier. Our company provides a wide variety of non prescription products. Look at our health portal in case you want to feel better. Our company provides herbal weight loss products. Look at our health contributing portal in case you want to feel better. Our company provides a wide variety of pills. Visit our health contributing website in case you want to look healthier. Our company offers a wide variety of non prescription drugs. Look at our health portal in case you want to strengthen your health with a help generic supplements.